And its in my humble opinion crap. All awards and cultists out there cant seriously consider this work worthy of competing in arena of star trek, star wars or anything else for that matter. only possible equivalent in quality is Firefly and thank god that took only one season to get off and away. This boring piece is junky mix of soap and confused writing. Personaly i tried i really tried to love this, maybe because of complete lack of quality SF production out there i really hoped that this will be gem i missed. I started to watch this ages ago and disliked it then. 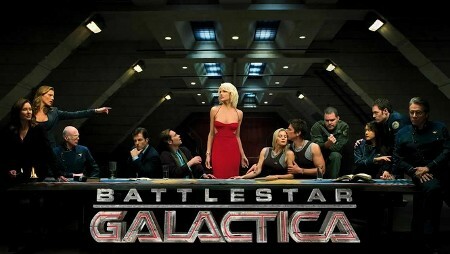 It is said to be developed by Ronald D. Moore as a re-imagining of the 1978 Battlestar Galactica television series created by Glen A. Larson, but honestly i dont see the development man made. Four seasons of potential ruined by emptines of screen writers. I would maybe speak about Adama Senior and rest of cast, or maybe about awards, or even about huge fan base but i will not, not worth it. Instead i will tell you that this junk produced even two spin offs, first similar Blod and Crome and one true gem. Brilliant and without doubt in its time BSG killer show CAPRICA, a prequel of sort in BSG timeline but fantasy hi tech world of its own. I cant figure for love of god who are people, but they know who they are, who killed Caprica after only one season and allowed to Battle Star Galactica to continue. It makes no sense but hey what does. Enjoy Caprica and forget about BSG, fast, i know i will. anonymous: "hate show, like review ;)"
anonymous: "battlestar galactica is similar to firefly, some hate it, others are plain stupid ;)"